Polyester workout fabric: It’s super durable, wrinkle resistant, lightweight, breathable and non-absorbent, causing sweat to evaporate, instead of soaking into the material. This moisture-wicking fabric is GREAT for outdoors because it repels UV rays AND insulates. Perfect for cooler weather! The Jazzercise Apparel Mesh Inset Tee is made of a recycled polyester spandex blend, and equipped with ¾ sleeved to warm you up when temperatures get cooler. Designed for chilly morning runs and air-conditioned studios in mind, its lightweight comfort and cute on trend mesh insets and adjustable side ties are great for variable temps. Sloungewear: when loungewear meets sportswear. Its relaxed fits and super soft fabrics remind us that comfort is key. Emerging from the athleisure trend, this very sporty look is food for those who wear activewear all day long. Less about embellishment, more about the right silhouette and soft-to-the-touch feel. Colors: Primary colors are big! Even though the Olympics are closed, blues and reds are still relevant in activewear. Soft heathers, neutral colors and mélange fabrics are a growing trend too. Colors are subtle, muted and sophisticated. Blush tones are gathering momentum as a trend. Prints: The print trend continues in bottoms and tops. Right now, it’s all about contrast. Soon we will see jacquards and textured fabrics take over – transitioning us into cooler seasons. Big is better: Large logos and statements on leggings take over – reminding us of the over-sized branding of the 90’s. Sporty Mesh: It’s all about mixing mesh and colors this season to create a true athletic look, especially in workout pants. From open geometric mesh to textural mesh piecing and layering, the sky’s the limit. Soon we’ll see the mesh inset trend transition into color blocking of different fabrics and contrasting colors in Holiday and Spring 2017. This will be a new way to hit “refresh” on your activewear. 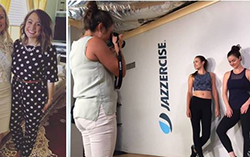 Look out for Jazzercise Apparel Holiday collection at the end of September. Christina, what are some of your fall favorites? The Mesh Inset Crop Pant in Eggplant: I love this fresh color for fall, the mesh piecing is super on-trend and the perfect just-above-the-ankle length makes my legs feel long. Space Dye Tank: Super functional and made of super soft space dye. The back design is very unique and mesh keeps you cool. I also really like the racerback design – so flattering! All the fun statement tees like our “Eat. Sleep. Dance Mixx. Repeat.” and “MOVE” tanks! High Neck Navy Top: I just love the mesh inset in navy, feels very fall and is a super flattering silhouette. Went to school in upstate New York and lived/work in the fashion industry in NYC before moving to San Diego. Hobbies – Going to Jazzercise classes, hip hop classes, photography, seeing live music, playing with dog Cagney. Polyester clothes are awesome. They are super easy to wash too.